24" x 30" Mat 1" squares on each side. Wet, Dry & Permanent Markers erase from the mat. 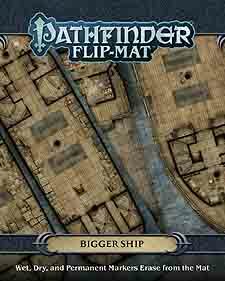 Whether smuggling cargo, boarding and plundering a prize, or sailing in style, the possibilities for adventure are endless with Pathfinder Flip-Mat: Bigger Ship. With an area that's 45% larger than Pathfinder Flip-Mat Warship at their disposal, Game Masters can now dream even bigger! This massive gaming accessory presents multiple decks of a richly appointed galleon, which could be home to common sailors, naval officers, and nobles on royal business - and targeted by enemy navies, pirates, or monsters from the deep! Don't waste your time drawing every cabin and hold. With Pathfinder Flip-Mat Bigger Ship, you'll be prepared the next time your players make ready to set sail!